After racking my brain for several days trying to figure out what I would artfully carve into my two carefully selected pumpkins, I finally settled on two designs: one from Assassin’s Creed 2 (…in a move that surprised no one…) and one based on my original idea to honor Chrono Trigger in gourd form. When I made the decision to carve another Assassin’s Creed pumpkin, I actually had another motive in mind. You see, last spring a friend and I made a pact to get inked together. She had something she wanted to get covered up, and me, well, I just like getting tattoos. After doing my normal hunt and gather techniques for the right design, I finally settled on what I affectionately refer to as my “Frankenstein” tattoo. During the time of my search I also happened to be reading the Sandman graphic novel series, a collection I adore due to both its thought-provoking content and its glorious art style, much of which is created by one of my favorite artists, Dave McKean (the movie Mirrormask is his love letter to visual expression). Within the pages of the Dreaming, I found a beautifully rendered key. 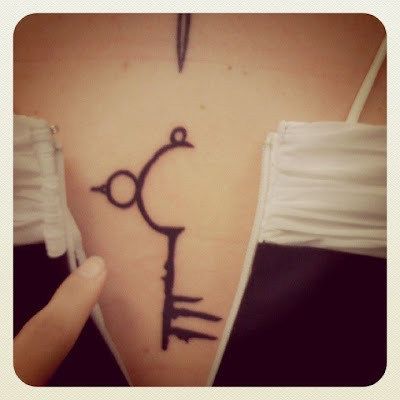 Because I have a mild passion for antique keys, I was instantly drawn to it and Xeroxed it the first chance I got, keeping it folded within the confines of my bag for a few months, anticipating the day when my friend and I would take the journey together to Ye Olde Tattoo Shoppe. As much as I loved the design, however, there was always something about it that struck me as a tad too gothic...but it didn’t bother me enough to alter my intention. A year prior to this I had been speaking to my husband about possibly getting a tattoo for Assassin’s Creed somewhere, arguing that the game meant a lot to me and I would love to commemorate that feeling by adding it to the eight other symbols gracing my person in the most permanent of fashions. He tactfully informed me that to get the most recognizable symbol, the “A”, would be akin to branding myself with the Golden Arches of McDonald’s, as Assassin’s Creed itself is purely a cash cow for Ubisoft. He suggested I find something within the game itself that had a higher meaning beyond the brand, knowing that AC is full of historical and conspiratorial symbology. After searching through the huge bank of symbols, I found the perfect glyph, the Mandelbrot Set; it’s beautiful fractal pattern representing in mathematics a ‘complex structure arising from the application of simple rules’, and graphed out as one of the ‘best-known examples of mathematical visualization’. The hidden puzzle points in AC2 were one of my favorite new additions to the series, so the symbol fit my wants perfectly. The only questions left were where (on me!) and when I was going to commit. At this point my friend entered with her idea. And now I had two designs. So…I combined them. The bit in the key that bothered me was gone (a rather sharp top piece) and my homage to AC was cleverly disguised. The tattoo now resides on my back at the midpoint, underneath three other carefully selected designs and will eventually be a spinal centerpiece when I am finished. I love it, as I love them all, and feel more complete, in a pagan sort of way, knowing it’s there. So even though that explanation is ridiculously long for such a simple pattern, I thought I would give some background as to why I wanted to carve it into a pumpkin as well. It seemed fitting, considering my new art and a new game on the horizon. An Ode to 2011, if you will. For Pumpkin Two, I used an exacto knife and carved the half-clock from the Chrono Trigger logo. It was messy, but fun, and I am happy with the results. That is all. Oh, and I titled this blog after the game, hinting to the idea that my love and life of video games started with this particular title. Isn’t that reason enough? This is a good year because a lot of stellar sequels have come out. Gears of War 3 I am still enjoying it bits and pieces, and savoring it as much as possible. Don't forget AC3, MW3, Battlefield 3. Man is there enough trilogies out this year or what!